This is one of the most beautiful crochet bedspread patterns I have ever seen. Nothing is as satisfying as when you complete this project yourself. Nothing brings out the wow factor as much as being able to say that it is handmade and you made it. This is one of those bed covers that could be passed on as an heirloom piece. Or if you choose to give it as a gift, it will be cherished for a long time. 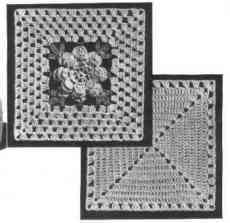 Crochet bedspread patterns are not as common as they once were and it is a huge project to undertake. You will find this gorgeous and easy crochet bedspread is a bit time consuming as you are working with mercerized cotton and not thick yarn. But it will be a stunning piece of art when completed. MATERIALS: J &P Coats Knit-Cro-Sheen or Clarks O.N.T. Mercerized Bedspread Cotton. 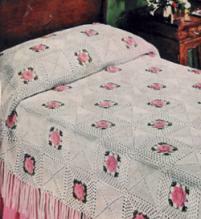 Single size bed: 66" x 108": 35 balls of White, 10 balls of Mid Rose and 2 balls of Hunters green. Double bed: 78" x 108": 42 balls White, 12 balls Mid Rose and 3 balls Hunter green. Steel crochet hook No. 7. FLOWER MOTIF: Starting at center with Mid Rose, ch 6. Join with sl st to form ring. 1ST RND: Ch 5, (dc in ring, ch 2) 7 times. Join to 3rd ch of ch-5 (8 sps). 2ND RND: In each sp around make sc, half dc, 3 dc, half dc and sc. Join. 3RD RND: * Ch 4, sc between next 2 petals. Repeat from * around. Join. 4TH RND: In each loop around make sc, half dc, 5 dc, half dc and sc. Join. 5TH RND: Repeat 3rd rnd. 6TH RND: In each loop around make sc, half dc, 7 dc, half dc and sc. Join. 7TH RND: Repeat 3rd rnd. 8TH RND: In each loop around make sc, half dc, dc, 7 tr, dc, half dc and sc. Join and break off. 9TH RND: Attach Hunter's green to center tr of any petal, sc in same place, * ch 7, holding back on hook the last loop of each tr make 3 tr in center tr of next petal, thread over and draw through all loops on hook (cluster made), ch 4, in same tr make 3-d tr cluster, ch 4 and 3-tr cluster; ch 7, sc in center tr of next petal. Repeat from * around. Join and break off. 10TH RND: Attach White to any 3-d tr cluster, ch 3, 2 dc in same place, * ch 1, 3 dc in next sp, (ch 1, in next sp make 3 dc, ch 1 and 3 dc) twice; ch 1, 3 dc in next sp, ch 1, in tip of next cluster make 3 dc, ch 3 and 3 dc. Repeat from * around, ending with 3 dc in same place as first 2 dc, ch 1, dc in top of ch-3. 11TH TO 14TH RNDS INCL: Ch 3, 2 dc in sp just formed, * ch 1, 3 dc in next sp. Repeat from * around, making 3 dc, ch 3 and 3 dc in ch-3 sp at each corner. Join as before. Break off at end of 14th rnd. PLAIN MOTIF: Starting at center with White, ch 5. Join with sl st to form ring. 1ST RND: Ch 3, 2 dc in ring, (ch 3, 3 dc in ring) 3 times; ch 1, half dc in top of starting chain. 2ND RND: Ch 3, dc in sp just formed, * dc in next 3 dc, in next sp make 2 dc, ch 3 and 2 dc. Repeat from * around, ending with 2 dc in same place as first dc, ch 1, half dc in top of starting chain. 3RD TO 9TH RNDS INCL: Ch 3, dc in sp just formed, * dc in each dc across to corner, in corner sp make 2 dc, ch 3 and 2 dc. Repeat from * around. Join as before. 10TH RND: Ch 3, 2 dc in sp just formed, * (ch 1, skip 3 dc, make 3 dc in next dc) twice; (ch 1, skip 2 dc, make 3 dc in next dc) 8 times; ch 1, in corner sp make 3 dc, ch 3 and 3 dc. Repeat from * around, ending with 3 dc in same place as first 2 dc, ch 3. Join and break off. For a single size spread, make 77 flower motifs and 76 plain motifs. For double size spread make 94 flower motifs and 93 plain motifs. Sew motifs neatly together, alternating flower and plain motifs and making 9 rows of 17 motifs for single spread and 11 rows of 17 for double spread. Cut 10 strands of white, each 12" long. Double these strands to form a loop. Insert hook in first sp on one long side of bedspread and draw loop through. Draw loose ends through loop and pull up tightly to form a knot. Make a fringe in each sp around two long sides and one short side. Trim ends evenly. 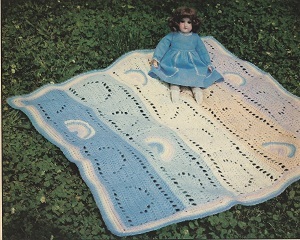 For more crochet bedspread patterns check out our free patterns page.